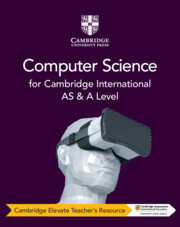 This series is for the Cambridge International AS & A Level Computer Science syllabus (9618) for examination from 2021. This coursebook with Cambridge Elevate edition has been developed by an experienced author and examiner team and written for the international learner. It provides you with a structured and progressive guide to the theoretical and practical skills required by the syllabus. 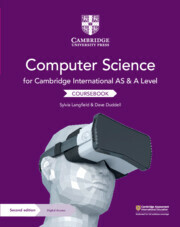 With an emphasis on developing computational skills, this resource helps to build your confidence in using a range of technology and programming languages. Detailed descriptions of concepts are reinforced with exercises, discussion points, and reflection tasks with exam-style and past paper questions. Answers are found within the teacher's resource. Written specifically for the international learner with clear explanations of concepts and associated key terms. Examples given in the three accepted programming languages (Microsoft Visual Basic, Python and Java) provide students with the opportunity to code with their preferred language. There is a wealth of opportunities to practise and consolidate skills through tasks, extension questions, and exam-style and past paper questions.